Lately, I've become somewhat obsessed with finding the perfect front pocket wallet. 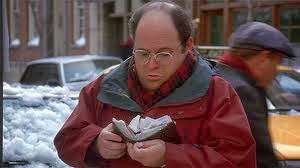 Like many of you out there, I have been guilty of approaching near George Costanza levels of wallet bloat and having a large wallet in my back pocket wasn't attractive let alone good for my back. Once I emptied my current wallet I discovered two things: 1) my empty leather wallet was still pretty large and 2) I really don't need most of its contents. Those realizations were the start of my search for a practical front wallet solution and what a search it has become! What’s more, I find people everywhere I go on web on similar quests. Since wallets are a very personal reflection of their owners and their owner’s lifestyle, there seems to be an endless number of wallet designs and even some radical solutions to this simplest of life’s choices. No place is the obsession with wallets more evident than the Kickstarter crowd funding site. There are dozens of wallet designs that have been funded or proposed over the last couple years with some raising fairly large sums but none highly successful. It’s an itch that people just can’t seem to scratch with a big build up and a seemly all too familiar let down in the project comment section in the months that follow. 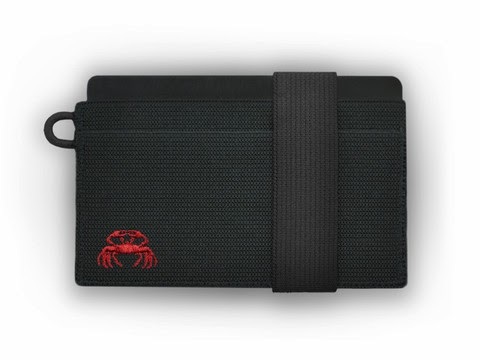 The most notable failure was the Crabby Wallet which raised over 308K but has been plagued by quality and durability problems. If your new wallet only lasts a month, you're going to be unhappy. Thanks to some great minimalist wallet review sites, I have ordered a couple of new wallets and I'll write more as I live with them awhile. A wallet can seem perfect in photos or on video but if that wallet isn't functional, it will quickly be banished to the dresser or desk drawer. Should be fun, stay tuned.